A MUSLIM CHILDREN'S FICTION BOOK THAT WILL ENCOURAGE YOUNGSTERS TO DREAM BIG! DALLAS, TX — April 17th, 2019. DJARABI KITABS PUBLISHING has partnered with As Sabr Publications to officially release Yaseen’s Big Dream by American Muslim Author Umm Juwayriyah. Umm Juwayriyah’s novel narrative style usually follows first POV style, and she excels at this way of narrating stories. However, in Yaseen’s Big Dream, she used third omniscient POV also known as frame narration which follows the traditional oral storytelling style of the djeli—the griot, to inspire the reader. Thus, Sullivan shows us that she also excels in this type of narration, too. We conducted a quick interview with the author and here is what she had to say about her recent work. 1. Why did you decide to write Yaseen's Big Dream? I wanted to write a book to encourage Muslim boys and girls especially—but all children in general to not be afraid to dream big, wild, dope—enormous dreams! I also wanted to tell a fun story where any child could slip into Yaseen's place and see themselves living unabashedly despite what the media depicts for us. Finally, I wanted to encourage parents, guardians, teachers, youth mentors to dream with their kids, too! 2. What do you want to achieve with this children's book? My goal for Yaseen's Big Dream is to get it onto the bookshelves of every public library in America! #MuslimGirlsRead, my literacy program, will also be sending it out for free to Muslim schools and daycare centers through-out America! This is a story for every child and so the objective is to get it read by children. Wonderful, and the reviewers have encouraging things to say. Alhamdullilah. 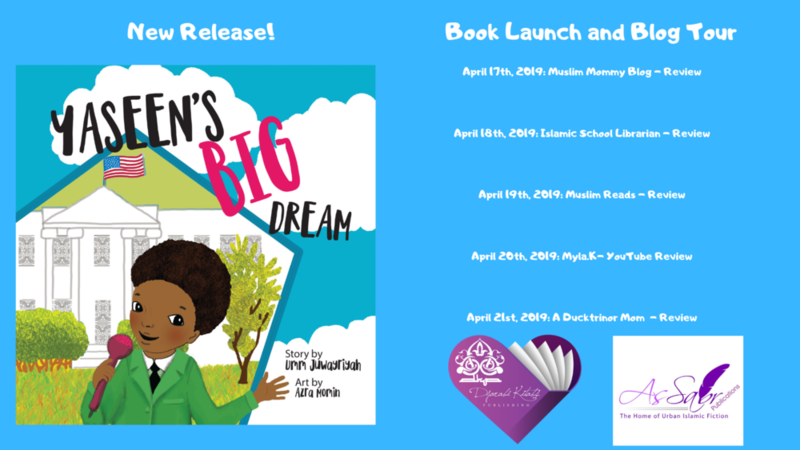 “With the backdrop of an ‘impossible dream’ that came true in America, Yaseen’s Big Dream by Umm Juwayriyah is an imaginative journey into the possibility of children’s dreams becoming reality, Insha’Allah. I enjoyed this Muslim family’s religious disciplines that shaped Yaseen’s heart and spirit to be the best Muslim he can, even while asleep. This book can be used to generate discussions about life goals and how even children—especially children—can make a huge difference in the world. Join us from April 17th to April 21st, 2019 on social media for the book launch and blog tours. Umm Juwayriyah (Maryam A. Sullivan) is an indigenous Muslim American woman born and raised in Springfield, Massachusetts; the former home of Merriam Webster Dictionary, the birth place of basketball, and the birth place of Dr. Suess! Her love of writing developed early and landed her an internship at the Republican News Paper during her high school day. Her journalism pursuits led her to spoken word, then play-writing, and finally to creating Urban Islamic fiction with her debut novel, The Size of a Mustard Seed. Umm Juwayriyah is a alumna of Bay Path University for women in New England and Regis University in Denver, Colorado where she received her Master's of Arts with honors. Visit her at http://ummjuwayriyah.blogspot.com/ . Yaseen’s Big Dream is available on Djarabi Kitabs Publishing's website , Amazon on paperback format, and Fofky's Online Book Cafe. Add it to your Goodreads shelf here.